The products include the improved Aria FAST and Impro FAST which can be rapidly deployed to ensure the continuity of safe, reliable water production for communities and industries around the world. The Aria Fast modular low-pressure membrane units provide reliable water quality under highly variable conditions. Capable of producing water within four hours of arrival on site, the units are suited for emergency situations in both municipal and industrial water applications. 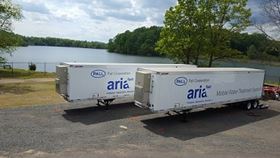 Aria Fast mobile systems use membrane technology to transform discharge water, ground water, surface water or secondary effluent into water that is free from suspended solids and harmful bacteria. The units can treat up to 1 million gallons per day (MGD) of impaired water. The Impro Fast mobile water treatment solutions use Closed Circuit Desalination (CCD) reverse osmosis technology from Desalitech. Impro FAST products have the flexibility to treat a broad range of incoming feeds for diverse applications from boiler or cooling tower makeup to brackish water desalination to municipal wastewater reuse. Evoqua Water Technologies signs a definitive agreement to purchase ProAct Services Corp, a US provider of on-site water and air treatment solutions. The new mobile water service centre in Atlanta, Georgia will better serve Suez Water Technologies & Solutions' customers in the Southeastern United States.